Approximately 75,000 years ago there existed a Super Earth that was located where the asteroid belt in our solar system is currently located, next to The Red Planet… Mars. The name of this planet was Maldek and at one point had a thriving civilization of giant humans that were about 70-90 feet tall. This civilization was very advanced in almost all ways except for spiritually. These beings simply were not seeking a path of unity, instead they built great weapons of war and destruction. Mars was at this time, 75,000 years ago, the habitable moon of Maldek. Another advanced civilization existed on Mars that were in conflict with the inhabitants of Maldek. A great war began between these two civilizations, Mars used nuclear weapons against Maldek destroying the planet. This forced the Maldekans to get stuck for 3,000 linear Earth years in a space-time bubble in-between dimensions. The Council of Saturn (Elohim), the guardians of our solar system, witnessed this occurrence and began transporting the beings from Mars to Earth. The beings from Mars started over on Earth and the beings from Maldek were incarnated as Neanderthals 46,000 years ago to begin their own individual evolution once again. Every 25,772 years there is a phenomenon called the procession of the equinox in which the title of the Earth’s axis changes in correspondence with the zodiac houses that Earth transitions through. This tilt change brings an opportunity to ascend into higher densities or experience a cataclysm, which depends on the collective or individual’s level of consciousness. About 50,000 years or two cycles after Mars and Maldek were destroyed; there were only 345,000 beings on Earth. However, only 150 beings on Earth were ready to ascend into 4th density. The Council of Saturn exists to assist the beings of this solar system through ascension, which happens at the end of every zodiac cycle. The Council of Saturn decided to lift the quarantine veil that was placed to protect the evolution of all the beings on Earth so that the souls from Mars and Maldek could incarnate. The Council of Saturn is the seeder and creator of our solar system. The quarantine was removed so that new souls can come in and incarnate on Earth. The Council of Saturn has since stepped back and observed, in order not to violate freewill. The Council of Saturn stated that we will witness the events of Earth without interfering until a positive call for help is made. So back to Atlantis… They were, at one moment in time, the most positive group on Earth. The remaining civilizations were at war with each other and Atlantis wanted to help harmonize everyone and become more loving. The priesthood of Atlantis called for help and the Council of Saturn Answered. The Council shared advanced pyramid technology, they were taught about crystals and how to heal with them and how to build sacred temples to bring in source energy to prepare for ascension, the procession of the equinox which they were unaware of. Atlantis became a medium for transformation on Earth, the Planet began to change for the good, and they used the teachings of the Council of Saturn for positive purposes. Now we have an advanced spiritual civilization that is doing positive work on a planet that has no quarantine fence around it to stop any beings from landing. This is where the Atlanteans began experiencing a fall from grace into a lower density. A group of reptilian beings known as the draco infiltrated the Atlantean priesthood and began manipulating them. The priesthood hoarded all their advanced teachings and stopped the citizens of Atlantis from having access to the pyramids and temples. They used the crystals for malicious motives that were not to empower and heal. A virus grew inside the priesthood and they became servants of the draco agenda and no longer served the People of Atlantis. They then created the first governmental body on Earth which was the root of the present day illuminati or cabal crime syndicate groups. The cabal group, the crime syndicates that were originally formed in Atlantis are the same groups that are on Earth and in our solar system presently. 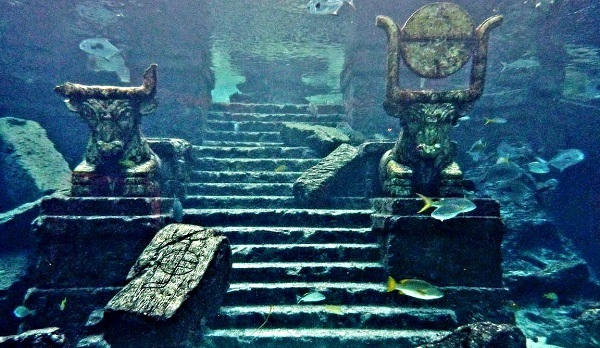 At the next procession of the equinox Atlantis was destroyed and sank where Antarctica currently is, the lost city of Atlantis is underneath the ice of Antarctica. So how does all of this tie into our present time? Well the crime syndicates are still here, they are controlling humanity. The good news is that the procession of the equinox is approaching; it is time to ascend into 4th density. Humanity is waking up to all of this, the enslavement, the torture, the depopulation agendas, the crimes against humanity, Full Disclosure, Our True World History and the love and empowered beings that we truly are! This information will reach every human ears and hearts on Earth and we will demand a transformation and it will happen. We will transform this world and our planet and species will ascend.